Rupert Murdoch's News Corporation has used voicemail hacking and other forms of privacy intrusion in the United Kingdom as far back as 2002. The goal is to get the most intimate insider information, stay ahead of the news cycle, and beat the competition. Where better to get information than the voicemails and other electronic data belonging to those in the news. The News of the World, Murdoch's flagship paper, hacked the voicemails of a kidnapped 12 year old, the widows of fallen soldiers, and even the powerful. In 2006, the Murdoch papers invaded the private medical records of former Labour Party leader Gordon Brown. A July 4 article by Nick Davies of the Guardian ignited the most recent focus on illegal actions by the Murdoch papers with the revelation about the hack of the 12 year old kidnap-murder victim. The outrage and subsequent revelations have laid waste to News Corporations plans for the total acquisition of a highly successful pay per view entertainment network, BSkyB. The yet to be verified source said that the investigator making the inquires was particularly interested in the phone data on British 9/11 victims. John Del Signore of The Gothamist said this of the Mirror's reporting: "Of course, this has only been reported in The Mirror, which is reveling in its rival's downfall, and eager to see Murdoch's bid for full control of British Sky Broadcasting go down in flames." 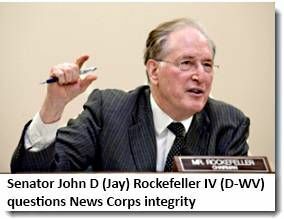 Senator Rockefeller is a long standing member of the Senate Select Intelligence Committee and was its chairman from 2007 through 2009. It's not likely that he relied on the Daily Mirror newspaper to form the basis for his concerns. It is highly unlikely that Rockefeller issued this brief but potent release without some evidence that the charges have merit. At this point, the Senator is just asking questions, in a public and very pointed way. Murdoch will need more than a horse to retreat from the bloody battlefield that he created of his own free will. During the just ten days following the explosive Guardian report on phone hacking by Murdoch's News of the World, he has sustained repeated attacks on his UK media properties, pending deals, and his personal integrity. Now a senior, well connected US Senator is questioning his integrity. Last week, the man Murdoch helped elect Prime Minister, David Cameron, indirectly defended Murdoch, then abandoned him yesterday. PM Cameron took just two days to agree with the July 7 motion in Parliament to oppose Murdoch's "must have" acquisition of pay cable giant BSkyB. The PM's surrender is all the more significant since it was put forward by his harshest critic, Labour Party leader Ed Miliband. All the while, the evidence of sleazy and scandalous behavior of the Murdoch papers has expanded geometrically.